Bricsys, a leading developer of dwg engineering design software, just added a new wing to their BricsCAD brand by introducing BricsCAD V15. BricsCAD V15 comes with powerful cad platform that combines the astuteness of 3D direct modeling with sophisticated 2D design on Windows, Linux. Support for Mac will be available soon. Now there will be only English version of BricsCAD V15. The BricsCAD interface contains context-sensitive Quad cursor through which you can produce technical drawings, 3D models, and layouts more accurately and speedily. You can maneuver all the drawings easily with the distinguished ribbon interface and Look From widget included in BricsCAD V15. BricsCAD facilitates the users for 3D direct modeling and assemblies in indigenous .dwg format. You can arrange components in 3D models with due order, and then make renderings more reasonably through the 600 new Redway materials available with BricsCAD V15. Bricsys is connected with third-party application developers that facilitate the users to get access over 400 applications running on BricsCAD. The wide-ranging BricsCAD development platform permits you to port AutoCAD®-based applications devoid of fine-turing the source code. The users can access a free 30 days trial of English version of BricsCAD. 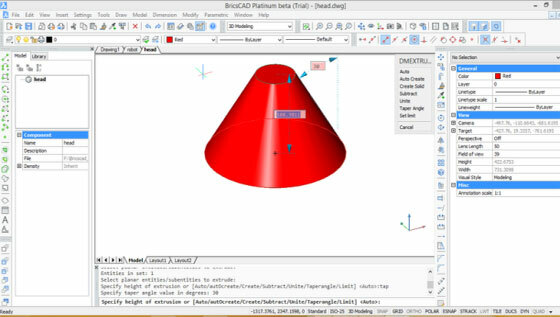 Other editions of BricsCAD provides the added solutions for Sheet Metal design, BIM planning, and 3D data exchange.